52 Mantels: Planning a Craft Night! Have you ever hosted a craft night for your girlfriends (or your boyfriends...if they're into that sorta thing)? If not, I totally recommend you do so, because it is a LOT of fun! And, believe it or not, fairly simple to do. 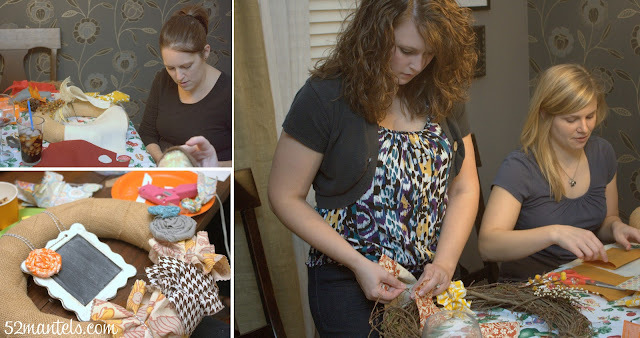 All it takes is a little planning, a little wine and a few willing friends (die-hard crafters not required). Last week I shared my Halloween party printable and glow-in-the-dark banner tutorial and hinted at the girls' night it accompanied. 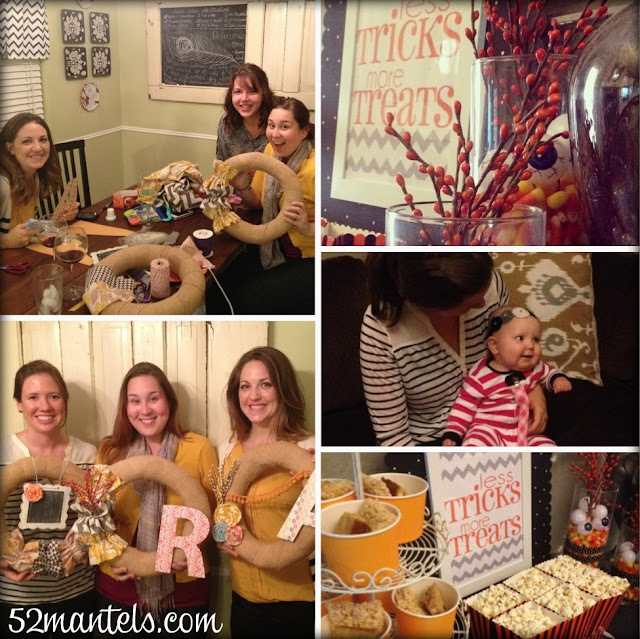 Today I'm going to share a few tips to help you throw your very own Girls' Night In ~ Craft Party! Aren't my friends cute?! We had a fun evening and everyone left with a pretty wreath! All in all, a great night. 1) Plan ahead: The key to throwing ANY successful party is in the planning. Decide what craft you'll do, what supplies you'll need, how much it will cost and, of course, where will the crafting take place. Once I'd made those decisions, the rest fell into place very easily. When setting up for your party, consider how long the craft will take and do any prep work that might otherwise eat into the party time. 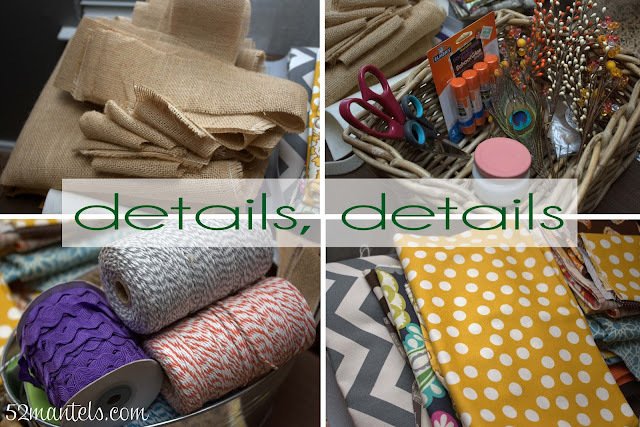 In my case, I pre-cut the burlap strips and laid out all the supplies. 2) Give your guests some options...but, not too many: When I'd settled on wreaths, I knew I wanted my friends to go home with a wreath that reflected their unique taste. But, I also knew that too many options can be overwhelming. So, I narrowed the choices down to a manageable list. 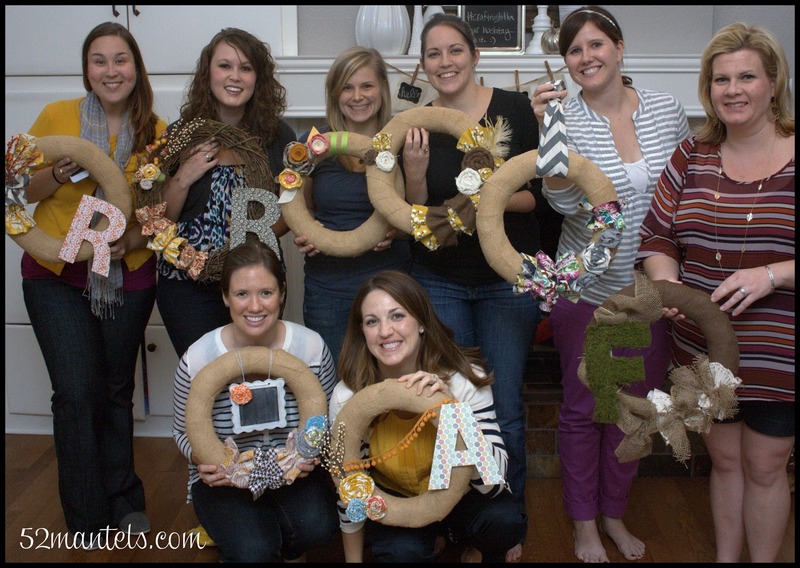 I let my party guests choose 1) a burlap-covered wreath or a garland wreath and 2) a monogram or a chalkboard. Then I picked a handful of fabrics and embellishments that covered a range of tastes. A few options = fun for all, too many options = potential frustration. 3) Make a set, all-inclusive price: For my party, I really wanted my friends to be able to just show-up. I didn't want them to struggle with gathering supplies, picking fabrics or trying to make decisions at Hobby Lobby. Because, while that is fun for me, it's not so fun for some people. Know what IS fun, though?? Just showing up! I did a little research on supply costs, factored in pizza for dinner and set a reasonable price. I also let my guests pay for their supplies via cash, check or paypal. 5) Offer a few simple tutorials: Everyone loves to learn a new trick or two. I planned a few quick tutorials to help my friends find their own, unique vision AND walk away with a new skill. In our case, I demonstrated how to make simple wreath ruffles and rolled fabric flowers. Our craft night was a lot of fun and, honestly, a breeze to plan. 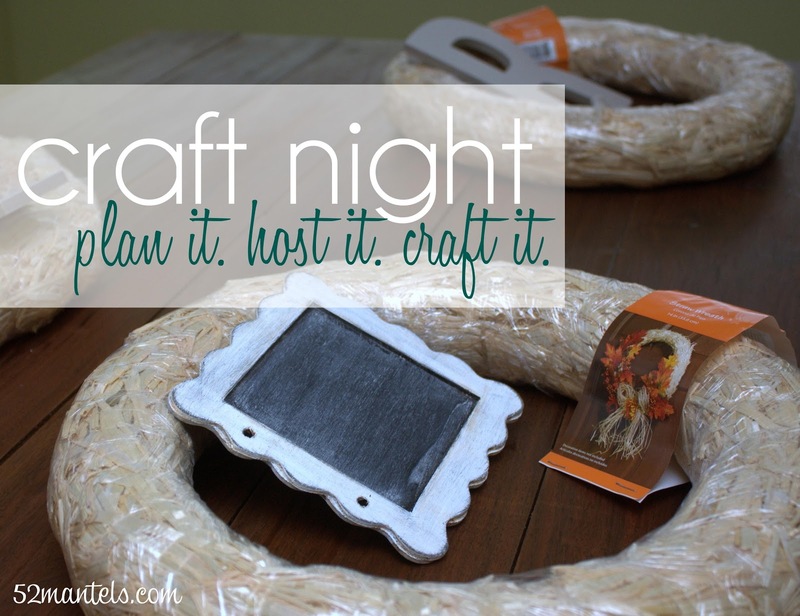 If you haven't hosted a craft night, I totally recommend it! How fun! And every one of the wreaths turned out darling. Is that your dining room? I would like to see more of your house. All I've seen is your mantel and your daughter's room! All of the wreaths look great and your house is sooooo cute inside! Looks like a super fun night! Thanks for the tips, Emily! I am planning a Xmas craft party and I was having trouble getting started. Now I know where to begin!! I may steal your wreath idea and turn it into a Xmas wreath. What a fun idea! I guess you decided not to go to the ice cream place. I like them all!!!! But I do have a favorite. Can I say? Is that bad form? This is so great Emily! Thanks for the tips. I've been wanting to do something like this...once a year we have a big craft day at church, but that's a huge production (I've helped put it on before) so something on a smaller scale at a different time would be great! The cost of this particular party was $15 each, which covered the wreath, fabric, embellishments, monogram/chalkboard and dinner. But, I used coupons and shopped sales. Great idea. I've had fleeting thoughts of doing a craft night with my girlfriends. You've inspired me to start planning it!!! What fun - when is your next soiree? I'd love to come!! Oh that looks like a blast! Maybe the book club girls want to do a craft night! Thanks for sharing that Emily! That looks like a lot of fun! I just might need to set a craft night up. What fun! I'm having a group of young married girls over in a few weeks for a Christmas package wrapping party. Wreaths would be fun, too! See I'm on the right track! Wonderful post! We just started our monthly "Pinterest Potluck" Group...and we also did a wreath for our very first meeting! In addition, though, each person brings a prepared recipe found on Pinterest, either tried and true, or one that is completely new. (Some recipes were crockpot teriyaki chicken, braided spaghetti bread, and peach sangria!) Then, we pin all of our fun crafts and new recipes to our group board.